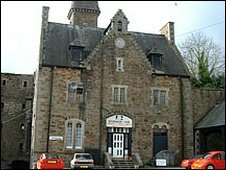 One of Cornwall's tourist attractions, historic Bodmin Jail, has gone into administration. The privately-run business with 52 employees will continue to trade while administrators, Begbies Traynor of Exeter, try to rescue the firm. Simon Wheten, who bought the business with his family in 2004, said it had been hit by the credit crunch. The jail was built in 1779 and carried out public hangings until 1862 and hangings inside until 1909. Since it closed in 1927 it has become one of Cornwall's tourist attractions, with 43,000 visitors a year. Mr Wheten told BBC News that the family had poured more than £1m into the business, but the bank had been unwilling to extend credit. He said: "It is far from a failing business which is why we are so disappointed to be in this position. "It is of huge importance to us to protect the 52 jobs here. "It is just a question of trying to find a way of going forward."